MAKE MONEY. SAVE MONEY. TRAVEL MORE. What ways have you made money while traveling? What ways would you like to make money while traveling? 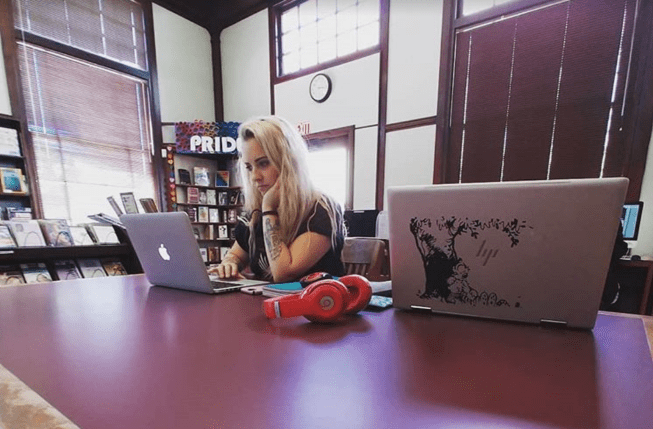 “How am I supposed to travel… and still make money while traveling?” – Me, 3 years ago. Back when full-time travel was still a dream in my pretty little head, this was my biggest and most burning question. A question that I desperately needed answered. I saw so many people around my age living the life of a digital nomad, traveling from place to place and making money online… I just didn’t know how to make it work for me! Luckily, I was brought into this world with endless curiosity and the ability to hyper-focus on what interests me. I spent thousands of hours researching, learning and putting what I learned to work. 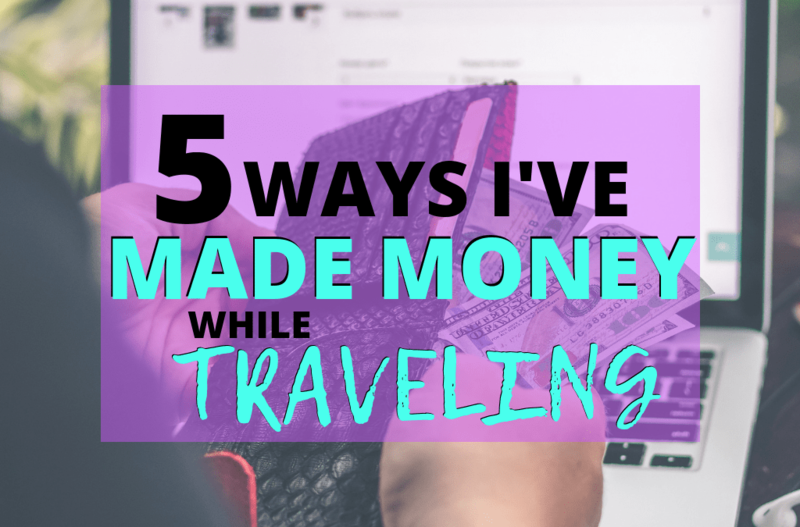 Because of that, I have earned money in many different ways while traveling! I have been traveling full-time since the early 2017, and I have been making my income online 100% remotely since then. 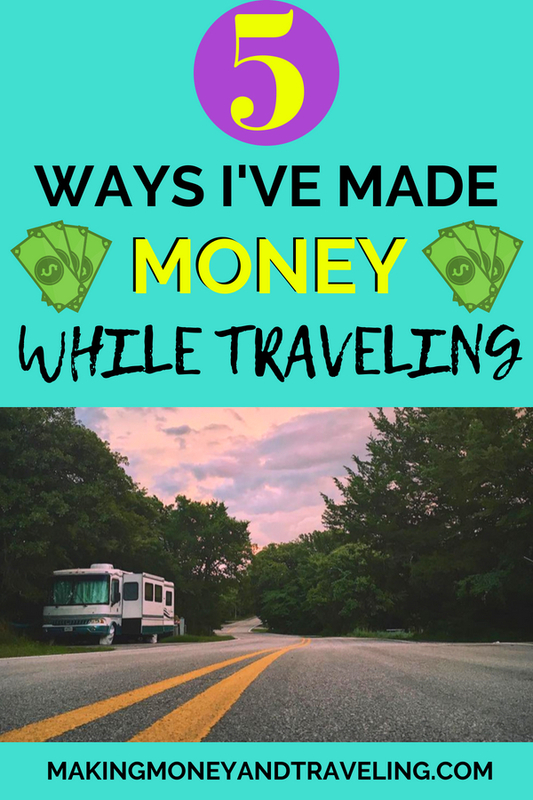 Here are my 5 Favorite Ways I’ve Made Money While Traveling! When I first started freelancing, I didn’t feel I had many marketable skills. I was still in the process of learning all I could about digital marketing, and the only skills I used in my “old life” were customer service and data entry type jobs. This made getting data entry jobs a no-brainer for me! I was able to find data-entry work on Upwork and even in Facebook Groups where I made connections with people who needed some help. Data entry can be many things, but what I did mainly was type information from written documents onto a spreadsheet. 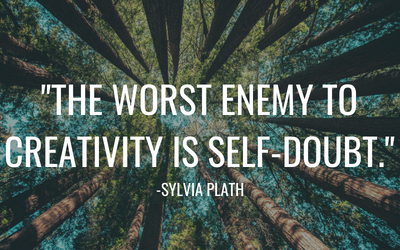 This work is easy – in fact, it’s TOO EASY. And it’s not quick either. I can type about 90 words per minute and I would still spend hours on end doing the data entry, and it can really start to jumble your brain a bit! I earned around $20 an hour on average with the data entry work I did, and most of the jobs only lasted about 16-30 hours. 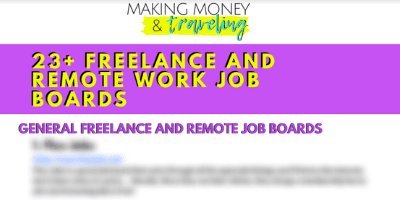 Enter your email here to get the free '23+ Freelance and Remote Work Job Boards' PDF download! Take the next steps towards your dream life today - these job boards were 100% hand-picked just for you! Your information is 100% safe and secure. I will never send you spam, I promise! Affiliate marketing has been the money-maker I was most interested in from the beginning. In fact, what got me interested in digital marketing and working online in the first place was the idea of earning a (mostly) passive income through affiliate marketing. What a great way to make money while traveling… passively! Right? I studied a lot of affiliate marketers, some awesome and some I wish I hadn’t. I spent lots of money on their courses and info-products and I learned A LOT. I learned a lot about what DIDN’T work for me, what kind of promotion I don’t feel okay with doing, but I also learned some things that have really helped me along the way. I’m nowhere near where I’d like to be with affiliate marketing and it’s still something I’m working on, but thanks to affiliate marketing I have been making a small passive income every month that I’ve been traveling. My affiliate marketing income has come from courses and software I personally used and recommended to friends and acquaintances when they had a need or a problem to solve. I also have affiliate links in some posts on this blog and am focusing on that going forward to build up my affiliate marketing income. My stance on affiliate marketing is this: If I don’t know the product or company, I won’t recommend it. If I don’t know and trust beyond a shadow of a doubt that the product or company will be legitimately helpful to the end user, I’m not going to recommend it. That feels shady and gross and I would never take advantage of people just to make a small commission. One of the ways I’ve made money on the road has been e-commerce! E-commerce is a broad term that describes selling physical products via the internet. 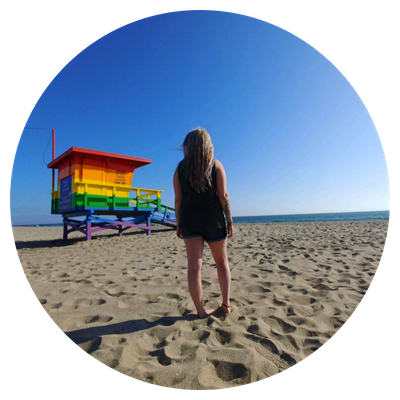 I dipped my toes into ecommerce very briefly before quickly realizing I didn’t want to do it. 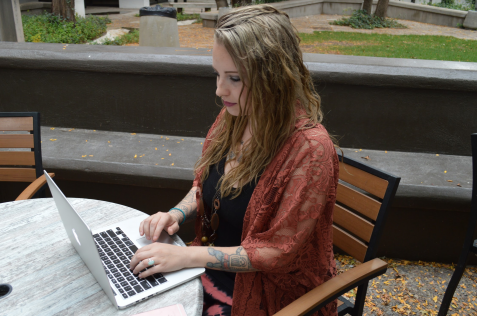 It felt too much like working retail to me – but online. The form of e-commerce that I played around with was Dropshipping – you may have heard of this. Basically, Dropshipping is where you source products from different manufacturers online (Aliexpress is huge for this), create an online storefront (I used Shopify), list all the products at a markup so you make a profit, and sell them. Once a customer places an order, you forward their shipping information to the manufacturer and purchase the product for them at a lower price, and you keep the difference. The manufacturer packages and ships the product for you, thus no need for inventory. It’s actually a really cool and viable way to make money online, but it wasn’t for me! I’m all about owning LESS physical things, so selling physical things didn’t make me feel very great. However, it is a great business model for anyone starting out with a very low cost to start. Okay, so this is one of the coolest and one of my most favorite ways that I’ve made money online. I basically took the information I knew really well and had learned, packaged it up into digital products in the form of an ebook or PDF, and SOLD IT. I literally sold my knowledge. That I already knew. I didn’t have to do anything to get ready to do it, I just packaged what I knew would help people out with a certain thing, grew an audience, and gave them what they wanted. I sold Instagram Audits and Mini-Courses to teach people how to leverage their Instagram Profiles to grow a larger audience. 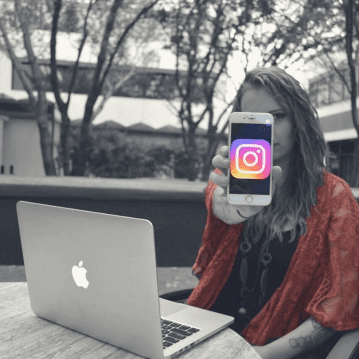 I gained a massive amount of Instagram knowledge when I first started learning digital marketing because I loved the platform. I grew multiple accounts into the thousands quickly and I knew I was onto something. Instagram was my primary source of income for several months. In addition to providing profile audits, advice and training, I managed several accounts for businesses and entrepreneurs. At any one time, I could be managing up to 40 accounts or more. When you manage that many, it’s a full-time job! As I learned more and more about Digital Marketing, I found my niche in Social Media Marketing, specifically Instagram. This put me in a position of authority as I started to offer advice, audits, and tips to help people grow their Instagram presence. Naturally, that led people to see that I was pretty good with Instagram. I started getting messages asking me to run accounts for businesses! A lot of businesses are just too busy to focus on learning or running their Social Media accounts, but they know how vital it is for their branding. That was GREAT for me! I started just managing Instagram accounts for acquaintances, and that blossomed into running Facebook pages as well. I still do Social Media Management to this day. I have long-term clients that I know I will work for every month, and I frequent sites like Upwork and Flexjobs to pick up short-term work as well. Here is a list of the top 15 websites to find freelance jobs. Here is a guide to learn how to find remote work for beginners. Here are 7 tips to land your very first freelance client! If you would have told me 3 years ago that I would quit my job, travel the US and sell people my KNOWLEDGE I would have laughed in your face and thought you were crazy. Like seriously… If the Mandela effect is real and I’ve jumped into an alternate Universe where anything is possible on the internet… I never want to go back. Hear me out here… anything IS possible on the internet. I am living proof of it. If you have the will to learn and pursue what you want, you can get it. The key is to stay out of your head! Stay out of your excuses. Keep your head down and keep working toward your goal, and you will get it. As you can see, I have been all over the place in just about 2 years time. This is a good thing because I’ve learned what I don’t like to do… But it can also be a bad thing. It is good to learn what you like and don’t like, but it is important to remember that at some point… You will have to commit to something and stick with it. It’s the only way to grow! Some great ideas there Carrie. I am sure a lot of folks will find value in this posts. About myself. Since I left corporate America 5 years ago, I have made my money from affiliate marketing plus some day trading here and there. What started out as a small operation has morphed into a big biz that allows me to travel the world pretty much worry free. Thanks Andy! When first learning how to transition to a traveling lifestyle, it’s easy to become overwhelmed. My goal is to help people see how attainable it can be! Like your experience, it always starts small and grows with time and consistency. Do you outsource any of your social media management work? With only so many hours of the day, it seems like it would be the logical way to grown your business. I don’t outsource any of it! I don’t have any need to currently. I considered going the agency route, but my heart wasn’t in it. I won’t be doing SMM forever, but it has been a great way to support me on the road thus far! The way you laid out your entrepreneurial path in this blog post is very relatable, and inspiring for people who, like you when you started out, only have entry-level job skills, to see how from that starting point you were able to figure out what you were good at and how to make money at it. Absolutely, I remember how hopeless I felt with my “lack of certification”. It took me a while to realize that I could literally re-invent myself… and anyone can. Hi! This was EXTREMELY helpful! Great advise! 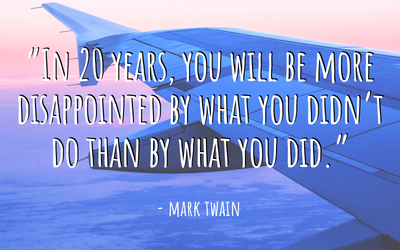 Happy to see fellow travelers fulfill their dreams. Good travels. 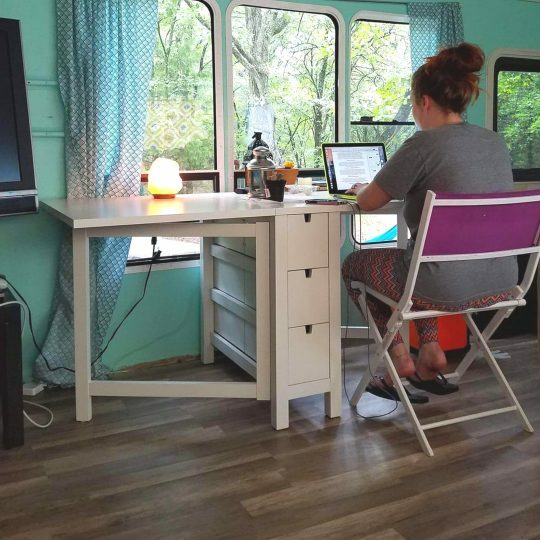 Creating a location-independent income so you can travel full-time (or work from home) is easier than you think – and you’re in the right place to learn how to do it! Stick around to learn how to take control of your life & finances so you can live the life of your dreams! Become a Traveling Programmer… For Free! Making Money and Traveling is a participant in the Amazon Services LLC Associates Program, an affiliate advertising program designed to provide a means for sites to earn fees by linking to Amazon.com and affiliated sites. Do you want to work remotely? Enter your email below and download the Free PDF: '23+ Freelance and Remote Work Job Boards'! These job boards have been hand-selected just for you. Your information is 100% Safe and Secure. I will never spam you, I promise!